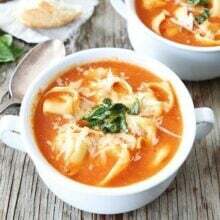 Creamy Tomato Tortellini Soup – we love this simple and delicious tortellini soup! A classic tomato soup turned up a notch by adding delicious cheese tortellini and served with crusty bread. Tomato soup has always been my favorite, you can’t go wrong with a classic. And now I have a new favorite tomato soup because this Creamy Tomato Tortellini Soup is SO good! 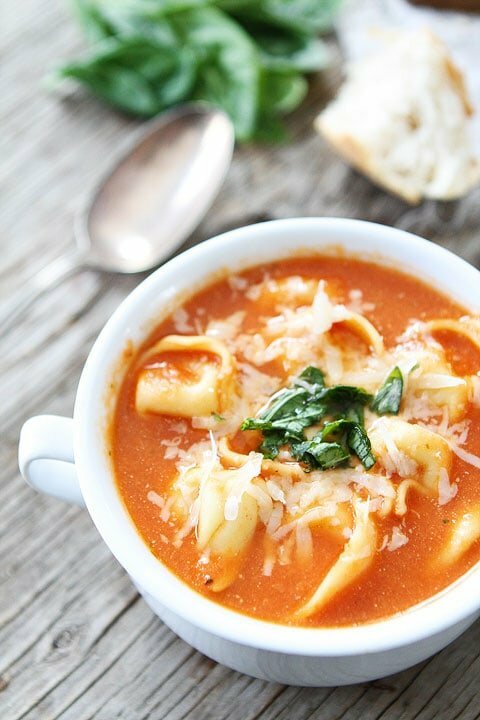 We kicked the classic tomato soup up a notch by adding cheese tortellini! We love tortellini and the cheese tortellini goes perfectly with the creamy tomato soup! 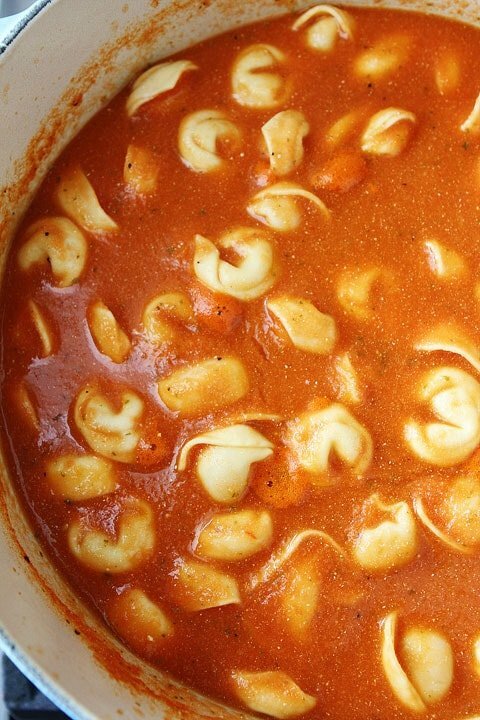 Our entire family loves this easy tortellini soup. It always makes a great lunch or dinner. You will think this soup is loaded with heavy cream because it is so creamy and so good, but Greek yogurt is the secret ingredient to this creamy tortellini soup. The Greek yogurt makes the soup super creamy without adding all of the fat and calories! Make sure your Greek yogurt is at room temperature before adding it to the soup so it will melt right in. If you don’t have Greek yogurt, you can use sour cream, but we love using Greek yogurt in this soup. 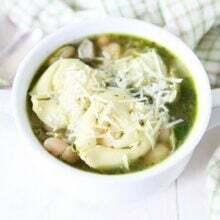 I like to add fresh basil and shredded Parmesan cheese to my bowl of warm tortellini soup! They are the perfect finishing touches to this easy soup! 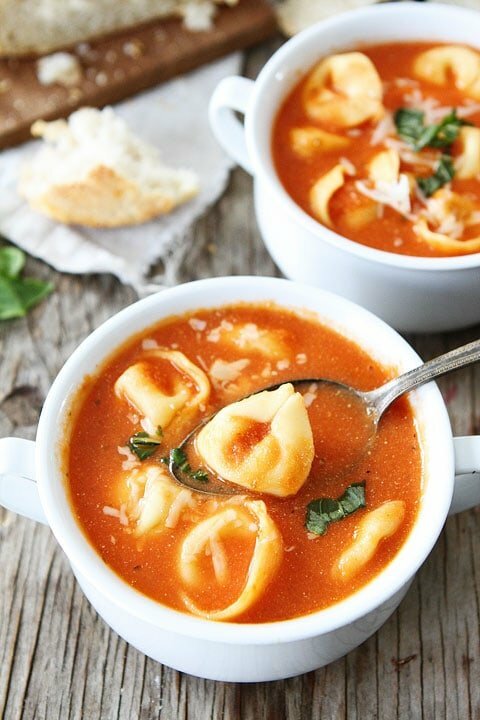 This Creamy Tomato Tortellini Soup is super simple to make and a hit with our entire family. Serve crusty bread on the side because you can never have too many carbs! Or you can make a simple green salad to go with the tortellini soup. You can’t go wrong when this easy tortellini soup is on the menu. It is always a dinner hit! This soup is perfect for a chilly day, I always love cozying up to a bowl of this soup! 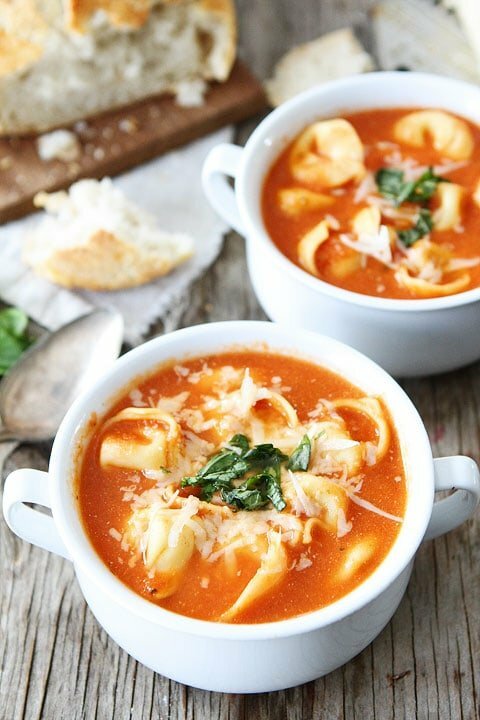 Creamy tomato soup with cheese tortellini! You will think this soup is made with heavy cream, but the secret is Greek yogurt! We love this simple soup! Your soup is gorgeous, Maria! I love the color, the flavors, the wood board, sooo so pretty! Btw I got my leggings and some for my daughter. We Love them!! THANKS for the rec! Never thought of using greek yogurt as a soup thickener. What a smart idea! The temps just dropped dramatically here, looks like such a wonderful cozy soup to warm up with. I can’t wait to try this…but wouldn’t it be easier and SAFER if you don’t have an immersion blender, just to blend the tomatoes first?…..Personally I love chunky onions and garlic! I bet this would also be amazing with Herbs de Provence! I am not a huge fan of Basil…but I guess for a few minutes it wouldn’t be bad at all. I hope I can get home this weekend and try this! I am in the Southeast! Yummy….could go for a bowl of that right now. Looks delicious! Maria, I’m relatively new to Two Peas and Their Pod, and I love starting my day with your newest recipe and post! In fact, I’ve got most of my co-workers hooked now. 🙂 Not only the recipes, which are fabulous….but the photos! You and Josh are awesome photographers. The photos bring the recipes to life! Congratulations on your upcoming big event, when baby makes 4. Nothing like a warm bowl of tomato soup! Tortellini too?! Win! Staying home with this soup definitely sounds way better than dealing with being out at a restaurant on Valentine’s Day! I like to use special occasions like New Year’s Eve and Valentine’s Day to make something special at home. I did duck for NYE, and I think I may do rib eye for Valentine’s Day. LOVE the idea of greek yogurt in there. My Josh doesn’t like tomato soup…I wish he did- its one of my favorites! Looks great- I’m with you– let’s stay home on Valentine’s Day! I could so use a bowl of this right now! Perfect for these cold winter days! this is just what the Doctor ordered- I would LOVE a big bowl right now! Would this soup freeze well? I’m in my third trimester and I’m on the look out for yummy meals to freeze! It should freeze just fine! The tortellini might fall apart a little after defrosting, but not much. I did find the pasta a little soggy after freezing so what I did was divided the soup once it was done into two containers. The first one I added the pasta to and ate immediately. The second I froze and then when I craved it again I defrosted it and heated on the stove, adding the fresh pasta to this batch. It’s a delicious soup! We do the same thing! PJ’s are where it’s at! And this soup, love! Looks so cozy and perfect for our rainy, gloomy day in Oregon. Thank you, Maria! This is a perfect soup for a winter day meal! I can’t way to try this very soon! This soup is right up my alley! I love this soup! This is making me so hungry!! I love tortellini! How would this freeze? Since I am single, I like to make soups that will freeze well for lunch/supper later. It should freeze just fine. Whoa! So yum. Pinning this to my tomato soup recipes board. They’re so many awesome ones to try. I love the tortellini that’s added! I love that this is made with Greek yogurt! Can’t wait to give this one a try! This sounds incredible! I think I know what’s on our menu for Friday! I’m with you – take me out to dinner whenever you want, but never on Valentine’s Day! This soup is pure winter comfort perfection….I love it, Maria! The Greek yogurt addition is awesome! Perfect comfort food for these frigid evenings! Love the Greek yogurt addition! This sounds delicious! and since it is virtuous calorie-wise you could really splurge on a yummy dessert!!!! I think we might just do this for our Happy Hearts Day too! mmm this soup sounds divine. We normally stay in for Valentine’s Day as well but since this is our last kid free Valentine’s day I insisted we go out! Is Greek yogurt a good/ok substitute when soups call for heaving whipping cream? This looks amazing! I’ve used it a few times in soup recipes and it’s worked great for me! It might not work in every soup though. I love tortellini soup, this looks so tasty! This is the perfect stay at home dinner! Love the tortellini! Huh! How come I never thought to put Greek Yogurt in soup instead of heavy cream?? Genius, you are! I’m making this as soon as I buy some Greek yogurt. I never thought of adding greek yogurt what a great idea! I may have to make this too! Yummy! How delicious and easy! I would rather stay home for Valentine’s dinner too and this looks like the perfect thing to make! Wow! Just made this for our lunch today (snow day!) and what a hit! I’ve always cooked tortellini soups in broth and wondered how I could make them better. This is it! Saving to try soon. I know it will be a big hit! What a beautiful, delicious soup. It would be perfect for this snowy weather we’re having. This looks delicious; I can’t wait to try! I’m a little late for Valentine’s, but this sounds good any day of the week/month/year. How would you (or would you) suggest adapting this to the crockpot? I am so happy I found this! I’m making this soup for a few friends who may have caught a cold from me while we were on a trip last weekend. I love to cook but I am just starting, and I’ve never made soup from scratch! This was the perfect recipe for me to start with. The house smells amazing and I am so proud of myself. Thank you!! Simmering on the stove waiting for tortellini to cook – smells amazing! Quick question though, my Greek yogurt didn’t blend completely – looks almost like curdled milk…. any idea what I could have done wrong? This looks awesome! Making me hungry! I made this last night…it was delicious! I didn’t change a thing, and it was perfect as written. I might try adding some spinach next time, but that’s because I like spinach, and not that the recipe needed it…EXCELLENT! This looks like something my family would be happy to eat. Yum! Wow does that look great! I will be making this over the weekend! I made this for dinner tonite & it was really good! Nice flavor & the creaminess using the Greek yogurt was so much healthier than heavy cream. I like spicy so I added more crushed red pepper. Delicious! This soup was great! Even my dad liked it and he usually isn’t a fan of my vegetarian meals. I doubled the amount of garlic and the amount of onion I used though. It was delicious! 5 of 5 stars!!! Thx from Germany! I make a very similar soup but also add browned Italian sausage to it for my meat loving husband. I love it as is, it’s one of my favorite meals! Ours blended right in, but if you need to reblend the soup after adding the yogurt, you can! You are making me hungry!!! Beautiful soup. Two of my favorite things! Tomato soup and tortellini – how have I never tried this before? Yum! To make this even easier, I used puréed canned tomatoes so no need to use blender. Excellent for dipping grilled cheese sandwich! Wow, could not have been easier to make, and very delicious! Made this for dinner tonight and it was really tasty, pretty easy to make and healthy too (at least it seemed healthy…healthy for us!) We made half the recipe and it fed two adults very well and the picky toddler passed on it. Maybe it was the spice? We had at least one serving left over. Really good!! Thanks so much for sharing this wonderful recipe! I made it for dinner this evening and it was absolutely delicious! Thank you for your delicious soup recipe that I shared with two of my three children today…the other was out with his gf….it was so wonderful they had two servings each, the only thing I changed was I added two tbsps. of sugar to cut the acid of the tomato. This is an amazing soup. I bought tortellini by accident (meant to get ravioli for a different recipe) so I’m making this again next week. made this today. what a nice easy soup! youngest teen son said that soup is his most favoritest ever. i doubled it, i knew it was going to great. the only addition was adding a rhine of parmesan reggiano. nice soup, going on rotation! The yogurt curled as soon as I added it. It looks bad but still tastes good. What can I do differently so that doesn’t happen next time? Sorry you had issues! Stir it well and maybe try room temperature Greek yogurt? Ours stirs right in! If we used heavy cream instead of the yogurt… How much would I have to add? Great recipe! I added about 4 cups chopped spinach at the end & topped with parmesan cheese – so good! Fall just blew into Michigan and this was PERFECT for lunch after playing outside! (Even with the bay leaf blended in that I forgot to take out! 😉 ) Perfectly thick and creamy…we will be making this again for sure! Thanks for sharing! Hello. I was wondering if you think I could replace the diced tomatoes with tomato sauce? My son will eat sauce but he does not like chunky tomatoe pieces. Thank you!!!! Oh my goodness. I just made this, I didn’t have basil on hand and it still turned out delicious!!! I can’t imagine the flavor after adding it!! Wonderful! Very good…I added a little sugar and some cream cheese to give it a little creamier base. We just had this for dinner and it was fantastic!! I added a little extra garlic and only blended about half of the soup because I enjoy having the bits of tomato & onion. Yum! Thanks for a great recipe! I made this for lunch today. It was amazing. I will definitely make a bigger batch next time. So creamy. it is definitely a new favorite of mine! This looks delicious, but my daughter has a dairy intolerance. Do you think that plain almond milk would work ok in place of the Greek yogurt? I thought of coconut milk, but wanted to avoid adding the coconut flavour. This is my stepson’s favorite meal! He was so excited today when I told him that we we’re having it for dinner tonight. I usually can’t get him to eat tomatoes or soup. Little does he know he just ate 2 bowls of tomato soup tonight. Made this for dinner – swapped the greek yogurt for tofu sour cream…so yummy! Thanks for the recipe! This recipe is delicious! Linked to you in a round up of my favorite soup & slow cooker recipes: http://2pawsdesigns.com/2014/11/soup-slow-cooker-favorites-cold-days.html Thanks for sharing! I made this last week for a very appreciative husband and baby. Thanks for sharing. And thanks to Pinterest for allowing me to find it! This is so delicious! I made it a few weeks ago as directed and it was perfect. 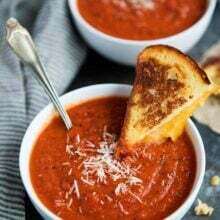 Tonight I am using this recipe for tomato soup and having grilled cheese instead of the tortellini (as requested by my fiance). This is my go-to tomato soup recipe now! Do you think using non-fat or low-fat greek yogurt would make a difference?? I looked through the comments to see if someone had already asked this so as not to bother you but it looks like no one else has asked or tried this. Thanks! You can use non-fat or low-fat. I do! Just got done making this! Very tasty and easy to make. However, the greek yogurt didnt smooth out when I stirred it in. It doesn’t affect it, but its not as creamy as I thought it’d be. Made this tonight. It was delicious! Added a little ground beef for husband who insists on meat. Will definitely make this again! Just made this For the first time tonight, it’s fantastic!!! Just made this tonight – it was delicious! I followed the recipe exactly, with three exceptions: instead of bay leaves, I used spinach (which I added with the tortellini), instead of red pepper flakes, I used two whole roasted red peppers (blended in with the tomato/broth/onion mixture), and, to avoid the curdling problem that some seemed to have, I blended the greek yogurt with some milk to thin it out before mixing it in – and mixed it as I poured it in. Pingback: 29 Cozy And Delicious Soups To Make This Winter - Do You Still Hate Me? I never would have though to add greek yogurt of all things to soup! What a fantastic idea! Made this last night and LOVED it! I added about a tsp of ground margarom but that’s the only change I made. Excellent flavor and now I have another thing I can make for my vegetarian daughter when she comes to visit! Can you use dried basil instead of fresh basil? If so how much? Sure! Try 1/2 teaspoon and taste. This soup is incredible! My Greek yogurt curdled as well but I used my immersion blender to smooth it out. It took about 3 minutes of blending to smooth out the “chunks” of Greek yogurt. I first tried to whisk it with a regular whisk, but it wasn’t working. I thought the soup tasted better the next day. I used 0% fat Greek yogurt. I plan to make it without the tortellini as well. It’s so easy to make and a great soup for a soup and sandwich or salad lunch! I’m sure it would easily be made in a crockpot too! Also for 2 people, this makes a ton of soup so I will probably half it next time. I don’t like freezing tortellini soups…my experience is the tortellini turns to mush when reheated from frozen. Thank you for another awesome recipe! I have to say that this soup will be a regular meal in our household from here on out – it was fabulous!!! Easy to make and satisfies the soul on a chilly night after being out all day. Thanks for the time you put into figuring it out, I am envious!! I just made this soup and when I added the Greek Yogurt it curdled and looks horrible. I had an instinct this might happen but decided to trust the recipe. I regret that I did not trust my instincts. Unless I can find a solution to this problem I will not make this soup again! This soup is a regular on my dinner menu with enough for lunches!! Thanks for creating it – it is fabulous!! The weather turned cooler here, and I was craving tomato soup. Problem is….Hubby doesn’t like tomato soup. However, yesterday was just a tomato soup kind of day. I found this recipe, liked how it looked, and told Hubby this is what we are having. Since I have both meat and cheese tortellini in the freezer (and he loves the stuff) I thought I could sell this. Only changes I made was the tomatoes and basil. It is not prime basil season, so although I can find fresh basil in my store, it is not always looking worth the price. My store did have the big cans of diced imported Italian tomatoes with basil on sale (2- 28oz cans for $3!! ), so I stocked my pantry previously while they were cheap. I used 2 of those 28 ounce cans for the tomatoes, and added about 1/4 tsp more of dried Mediterranean basil to the soup. I added some of the hot soup to the yogurt and stirred it in to dilute it a bit, then poured it into my soup and used my immersion blender to whirl it all up. It came out perfectly smooth and creamy. I tasted it at this time, and the seasoning was spot on! Lastly, I had some fresh spinach in the fridge, so I added 4 cups of fresh baby spinach to the soup after it was blended, and let it simmer on the stove. This soup was so good, I didn’t add the tortellini – just served it with some grated Parmesan on top, and a crusty whole grain loaf. The true testimony is that my husband HAD 2 BOWLS of soup he swears “he doesn’t like” and he didn’t add any of the tortellini to it either. He put some frozen tortellini in a container and was ladling in soup this morning to take to work for his lunch, and he told me this recipe is a keeper. We have a lot left over and put it in the freezer. Anyone know how long it will stay good in there? You can keep it in the freezer for 4-6 weeks. This soup was wonderful! It is definitely something we will be making again. Thanks for posting it. This soup is delicious! I’m having it as we speak… you might think about adding a step – to pull the soup from the heat BEFORE adding the yogurt. Wasn’t thinking and added it while it was still on medium heat and it curdled. I just took an immersion blender to it and all is fine. But you should add dairy to something while it’s still on direct heat. Looking so delicious. The colour of your dish is tooooo good. I loved the recipe and thinking of to make it soon. I’m lactose intolerant, would it be possible to leave out the greek yogurt? Sure! It won’t be as creamy, but still good! Hi! I made this a few months ago and it was fantastic! However, as I let the leftovers cool, and especially the next day, all of the sauce had been absorbed into the tortellini, so it turned into a pasta dish with a little sauce, instead of a soup. It was still good, but I missed the soup aspect of it! Did I do something wrong, or is that just the nature of the noodle? I used dry packaged tortellini instead of frozen/fresh, if that would make a difference. 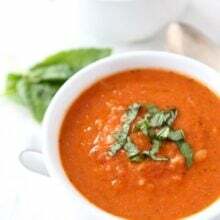 Can you freeze the creamy tomatoe basil soup? Love the recipes. I just wish there was some nutritional information included for those of us with dietary restrictions. 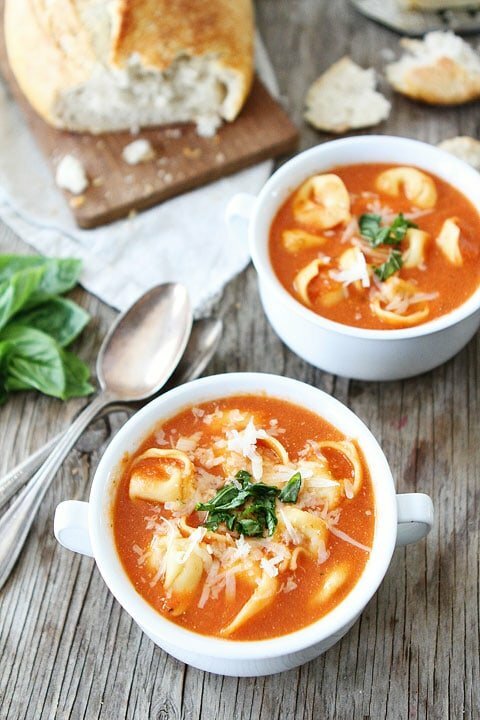 Creamy Tomato Tortellini Soup”. Even I can give them secretly. Thank you so much for sharing it! This soup is delicious! Quick question – do you have any tips for getting the yogurt to dissolve? I’ve tried with whole Greek yogurt and 2 percent and both still have white flakes in the soup. Wow! I’ve made this soup a few times now and it is so easy and fast and DELICIOUS! Thank you for sharing. I added half a green pepper when I n put in the pureed tomatoes for a bit of extra flavor and sour cream I stead of plain yogurt. Truly amazing! So glad you like the soup! Super yummy. I love vegetable and great recipe. Thanks Maria. Such a great recipe and so easy! I added more red pepper flakes to give it a kick. Great go-to soup! Loved this! I decided to make the Tortellini separately so the pasta would not get too soggy. Even better the next day. I just made this and it turned out AMAZINGGG!! The yoghurt doesn’t curdle if you ensure its at room temperature. Thanks for your anti-curdling advice. Still very cold here in New England and it’s almost spring! Will try this soon! So easy & delicious. It will be one of our regular meals!! This looks delicious! I’m getting so excited for the fall and winter soup season! This recipe has me counting down the days to chilly weather! Made this using Kite Hill almond milk yogurt and vegan raviolis. Tastes amazing! Perfect soup for my craving. Thank you! I just made the soup for dinner and it was delicious and perfect for a cozy fall night! I am going to freeze half of it since it’s a lot of soup for just two of us. Thank you for posting this recipe! Made this soup and it very good. Although the Greek yogurt has less calories, I think I would have preferred heavy cream. Go big or go home right?! Otherwise, it was perfect on a cold afternoon! Thanks for the recipe! Made this and absolutely loved it! This one is definitely a keeper! Thanks for sharing! This soup is so good . I made it several times ,didn’t have fresh basil so I used 1/8 cup dried. The second time I only put one package of tortellini as I found that with two it absorbed too much of the liduid.